Just a week until we kickoff the 2017 NFL season, the road to Super Bowl LII in Minneapolis is nearly underway. 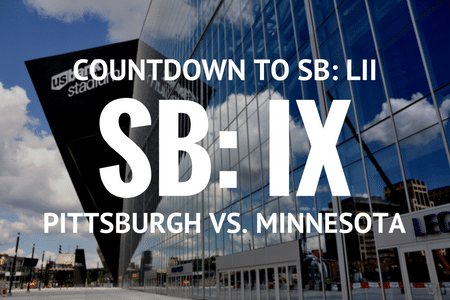 Looking back at Super Bowl IX, another appearance from the Minnesota Vikings. Nearly 81,000 fans were in attendance for Super Bowl IX, played once again at Tulane Stadium in New Orleans, Louisiana. The Pittsburgh Steelers, AFC champions, would face off against the Minnesota Vikings, who were taking part in their second-straight Super Bowl appearance. The Steelers would make sure to dominate Super Bowl IX, with the Minnesota Vikings’ only score coming as a result of a blocked punt. Pittsburgh would also be without some of their most talented players, including linebackers Andy Russell and Jack Lambert, both of whom sat out due to injuries. The Super Bowl IX MVP award was given to Steelers running back Franco Harris, who recorded over 150 yards and one touchdown on the ground. Super Bowl IX halftime entertainment was provided by none other than Mercer Ellington and the Grambling State University band, a tribute to the great Duke Ellington. The game was broadcast on NBC and was covered by announcers Curt Gowdy, Al DeRogatis, Don Meredith and Charlie Jones.